I have a 2013 Hyundai Tucson. I also have a brand new Galaxy S4. My problem is when I try and get music out of my Galaxy S4 through Bluetooth my command buttons do not work. Over at Verizon they say it is my car. I went to the Hyundai dealer and they say it is my Galaxy S4 that is the problem so I am in between I don't know who to believe all I do know that my music cannot be played in my car from my control buttons on my steering wheel. I am one unhappy customer because of this I don't know who to ask at this point no one wants to take blame may be you have an answer? Many manufacturers require that the vehicle be in Park before you can access the pairing function. Additionally, just like your mobile device may need software updates, so do many vehicle infotainment systems that support connectivity like Bluetooth. Check with your manufacturer to see if an update is available if you are having issues with connecting to the infotainment system. 1. From the device Home screen, touch Menu Menu Key > Settings > Connections > Bluetooth. 2. Touch the slider Slider Off to turn Bluetooth on Slider On . 3. Touch Scan to search for nearby devices. 4. Touch the device name in the list of Available devices. 5. If requested, the vehicle will prompt you to enter/create a passkey. This passkey can be anything you like, as long as you enter the same passkey of both the car and the mobile device. Some vehicles will have a predefined passkey on a card. 6. The two devices will pair and connect. If requested, allow access to the device contacts on the vehicle. Note: For all functions to work properly, both devices must support the same Bluetooth profiles. 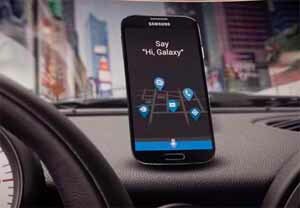 Please check with your vehicle manufacturer for compatibility with Samsung devices.